At 48-0, and possibly one fight left in his career, who will Floyd Mayweather Jr. end his career in the ring against? That is the question that has been on many people’s minds since he out boxed, and made his fight with Manny Pacquiao look like sparring match. One name that has been thrown around, Gennady “GGG” Golovkin (32-0, 29KO). GGG is in a totally different weight class, and is a lot bigger than Mayweather. Mayweather typically fights at 147lbs, and also walks around roughly at that weight. GGG fights at 154lbs, but cuts to make that weight. He easily puts on 20+ pounds after weigh-ins. 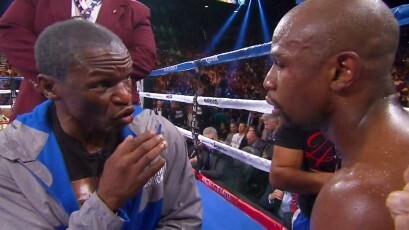 Floyd Sr. was asked about the fight, check out what he had to say.